Wigan Athletic star always knew Kane was able! As a promising youngster in the Tottenham youth set-up, Nathan Byrne always thought the team’s centre-forward was a pretty decent player. However, he admits watching his mate Harry Kane become one of the best players in the world, England’s World Cup captain AND a leading contender for the Golden Boot has been slightly surreal! “To be honest, I probably have been a bit surprised to be fair,” Byrne told the Wigan Observer. “When you’re growing up with someone in the youth team, and the reserves, you never really think about them getting to the level he’s at now. “Fair play to him, though...he’s done fantastic, he’s playing so well, and it looks like he’s going to remain at this level for a number of years. “He’s managed to break into that world-class bracket now, and he deserves all he gets. Kane’s predatory instincts that produced five goals in England’s opening two group games – ahead of Thursday’s decider against Belgium – were always there from a very young age. Although Byrne is the first to admit the rest of Kane’s game has needed some fine-tuning to allow him to do justice to his raw talent. “When we were kids he was always a great finisher, very clinical in front of goal,” the Latics player of the year acknowledged. “If there was a criticism, he wasn’t all that mobile, he couldn’t move all that much, he was much bigger as a kid. “Now he seems to be moving a lot better, much quicker, and that’s helped him so much in his game. Kane wasn’t the only one from that Spurs set-up that made it to the top, with the likes of Andros Townsend, Tom Carroll, Ryan Mason and Jake Livermore also breaking through and achieving international honours. “Looking back, we had such a talented team back then, I was very blessed to come through the ranks with some excellent players,” Byrne recognised. “It’s quite rare but the vast majority of that side have gone on to make it at Premier League or EFL level – normally the success rate is maybe two or three. 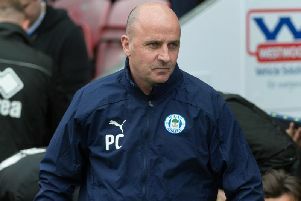 Byrne has also been keeping an eye on Latics colleague Sam Morsy, whose participation with Egypt has sadly been rather less successful than Kane’s and England. “I’ve been really enjoying the World Cup overall,” added Byrne. “Obviously it’s a shame about Sammy and Egypt, but on the whole it’s been great.